Erik and I are lost. We think we are somewhere between Amadeo and Tagaytay. My photographer friend and I are on a job, trying put together a story that seems to be going nowhere quick. Finally, lunch rolls around. We need the break, badly. 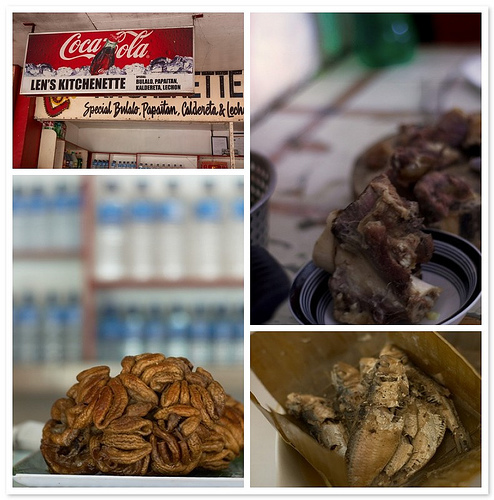 With our bruised egos and sore legs, our guides finally lead us to the Mahogany Public Market and to a little eatery called Len’s Kitchenette. Len’s Kitchenette is small roadside place connected an open-air public market. Nothing fancy here. Just a bunch of white, wooden tables, a glass case displaying the day’s deep-fried specials and several stainless steel chafing dishes filled to brim with saucy, savory delicacies. In true turo-turo fashion, there are no menus here. Guests come up to the counter and choose from the myriad of dishes prepared by Len and her girls for the day. While hungrily awaiting our food, I take in the surroundings. The place is packed. But, these aren’t your typical, city-weary Manilenos. I realize truck drivers, salesmen, market vendors and families of shoppers—regulars and local diners—surround us. A food lover’s tip: when in a strange town or place, follow the local crowd. We are definitely in the right place. On the touristy side of Tagaytay, the view is of beautiful vistas of the green, rolling hillsides and the serene waters of Taal Lake. At Len’s, the view is of butchered meats, sides of pork and beef hanging on display in front of the public market. Grotesque for some. Endlessly fascinating for others. A couple of minutes later, our food arrives. It’s simple fare, really: beef shanks stewed in a beef broth and seasoned with fish sauce, tawillis (a small, local fish) wrapped in banana leaves and cooked in a vinegar-ginger soup and pork intestines, deep-fried to crackling scrumptiousness (doesn’t it look like a brain?). Local food enjoyed by Pinoys everywhere, everyday. But what really captivates me is where we are and what we are doing. Eating outdoors. Surrounded by locals, loving their food. Chowing down on food sourced from nearby farms, bought from a local market, next-door and cooked on-site. It doesn’t get better than this. Our story maybe lost. But as least, Erik and I had a delicious lunch and great photos to prove it. PS. I am fascinated by the fact that Pinoys eat everything on a cow or pig. It’s not always about the ribeye or pork chops, people. Once again, many, many thanks to Erik Lacson for making the everyday look amazing. tanong lang, hindi po ba parte pa rin ng cavite province ang tagaytay city/town? Ah... you've successfully took me back to my last trip to Tagaytay a couple years ago. It was such a great trip with some awesome food. The views alone are enough for me to go back! I loved all the little kitchenettes and "getting lost" is a great way to find those hidden eats! That's not your case, but at least you've explored one great local restaurant. Hi Anon. Thanks for pointing that out. Tagaytay City is in Cavite. I'll make the correction. Hi Angel. I guess the reason people love tagaytay is basically it breaks the routine. A mini vacation of sorts. A food trip you can do over and over again. we missed this kitchenette. and we didn't follow where the crowds were. we ate at the first turo-turo from entrance. we nearly choked on our meals when the bill arrived- P850 for 1 medium bowl of bulalo, 2 small boat saucers of kare-kare, 2 small saucers of tawilis, 1 tiny plate of sinaing na isda, 7 scoops of rice, and 2 coke drinks. no, the food wasn't that good. next time, its this kitchenette. thanks for the tip.